Prominent & Leading Manufacturer from Valsad, we offer agriculture vermi beds, green vermi beds and vermi beds. We are engaged in offering the Agriculture Vermi Beds to our clients. We are the leading manufacturer of the Green Vermi Beds from valsad. 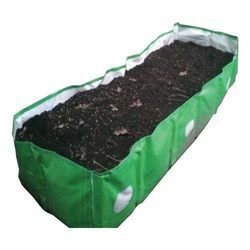 We are the leading manufacturer of the Fertilizer Vermi Beds form valsad. We are offering Vermi Beds. We can also offer Vermi Beds produced and marked with IS- 15907: 2010 marking manufactured by our associated concern. Our associates are valid license holders to produce and mark Vermi Bed (AGRO TEXTILES- HIGH DENSITY POLYETHYLENE (HDPE) WOVEN BEDS FOR VERMI CULTURE). Vermi Bed produced by us are 100% heat sealed and are tested at every stage of production as per IS- 15907: 2010. All the Bed are fitted with Six Polyethylene Net Windows (3 each on both sides of length) and One Netted Outlet at the bottom of the bed. Minimum 6mm dia rope is provided in the hemming. We offer Vermi Bed of standard size as prescribed in IS- 15907: 2010, it can also be offered as per your requirement. Vermiculture/ Vermicomposting through Earthworm is economic and easy technology to convert all bio-degradable waste into best quality organic manure. 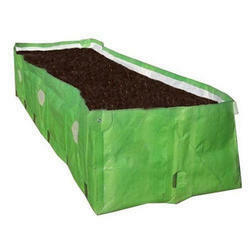 All types of bio-degradable materials like urban solid waste/ rural solid wastes/ food processing industries’ wastes (Agro Waste) can be used to produce organic manure by adopting Vermiculture/ Vermicomposting process. It is the most Eco-friendly solution to reduce the most talked about problem of global warming by reduction of use of chemical fertilizers and pesticides. Sustainable use of self produced organic manure helps improvement of soil structure, porosity and overall fertility of the soil. 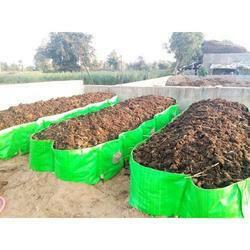 It can also help in development of wasteland by use of vermicompost manure. It improves soil structure, texture, aeration, and water holding capacity and prevents soil erosion. Vermi- Wash i.e. 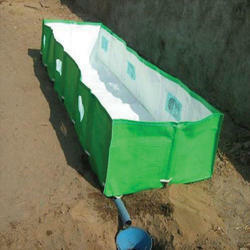 the liquid generated due to vermicomposting is a very effective and organic pesticide.